Google ended its Glass Explorer program a year ago, bringing a welcome end to the experiment. But Google Glass is not dead. Instead, the device is being resurrected as a tool for workplaces, and government regulators just released images of a prototype. Guess what? The new Glass looks just like the old Glass, and sounds just as pointless as ever. We knew this was coming. When Google retired the consumer-facing program, it was widely reported that Glass would find a home in factories and hospitals. There, professionals could put the technology to use making widgets and saving lives. 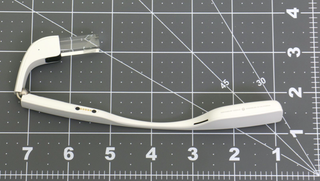 Despite earlier rumors that Google Glass 2.0 would be a sensible clip-on attachment for regular glasses or safety goggles, new images released by the Federal Communication Commission (FCC) show that the “Enterprise Edition” of the wearable device is actually bigger and bulkier. That provides room for a new Intel Atom processor, a 5-GHz wifi band, and a better battery. The new Glass also folds, just like regular glasses. This is not to knock new or transformative technologies. But Google Glass is never going to be one, so why does the company keep trying? And if they’re going to keep at it, can’t they try harder than this? Indeed, the very futuristic world of heads-up displays is already changing how anyone from soldiers to motorcycle drivers goes about their day. But something has always felt off about Google’s pursuit of a temple-mounted camera with a teeny screen attached to it. When Glass was still a Google X project, it seemed like a wacky way to do some R&D on voice recognition and user interface design. By the time models were wearing Glass on Diane Von Furstenberg’s runway show, the whole circus felt like a marketing ploy, and it remained unclear if the device would ever offer any real world applications. Hiding Google Glass in the workplace isn’t going to stop the public from worrying about the device invading their privacy. (The new version does have an indicator light that turns on when the camera is in use.) Meanwhile, it seems obvious that augmented reality devices, like Sony’s silly spy goggles or Microsoft’s still experimental HoloLens, can offer more features than Google’s tiny little prism. After all, doctors are already using virtual reality for medical purposes. Google and its new parent company Alphabet are free to develop whatever technology they want. It’s just a shame that the company is spending money hand over fist on a useless gadget when it could be funding its own research to find a cure for cancer. The media—this blog included—remains oddly distracted by Glass, which seems to be encouraging Google to keep pursuing the dumb idea. Then again, Silicon Valley is drowning in those these days.